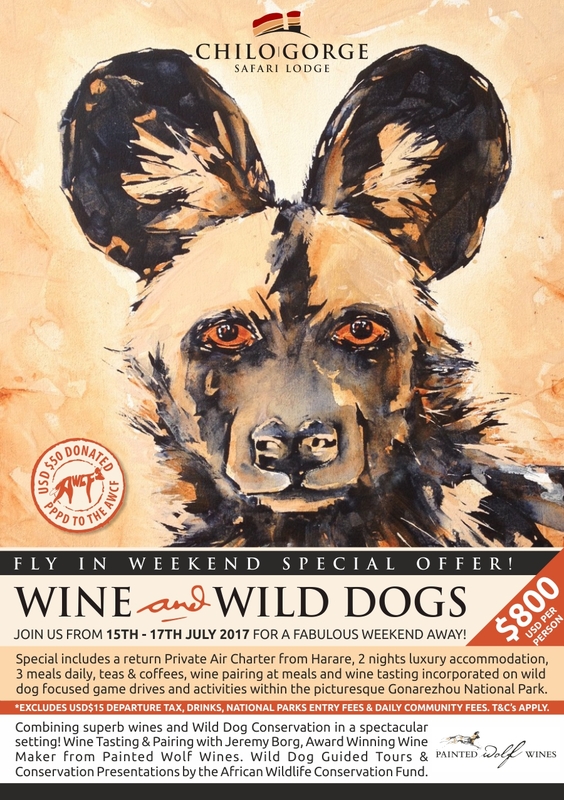 2 night Fly In Special including Wine Tasting and Pairing with Award Winning Winemaker Jeremy Borg from Painted Wolf Wines in Cape Town and Wild Dog based activities, slideshows and conservation with the Team from the African Wildlife Conservation Fund. This includes Return Private Air Charters from Harare, 2 nights Chilo Luxury Lodge, 3 meals daily, Teas & Coffee, Wine Tasting and Pairing, all Wild Dog focused activities (including game drives into the Gonarezhou National Park) AND USD 50 per person per day donated to the African Wildlife Conservation Fund. EXCLUSIVE of USD 15 departure tax, Parks (USD 5 per entry) and Conservation Fee (USD 5 per person per night).